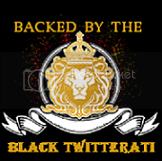 Black Twitterati: Blogging While Brown 2010: You Going?Black Twitterati- Celebrating the Black Twitterati... one tweet at a time. Who's worth following, who isn't. I was a workshop presenter at the 1st annual BWB conference held in Atlanta. I haven't been able to attend the 2009 or 2010 BWB Conference ... however, I think that it is a wonderful learning experience and highly recommend it for Black bloggers or blog-readers!